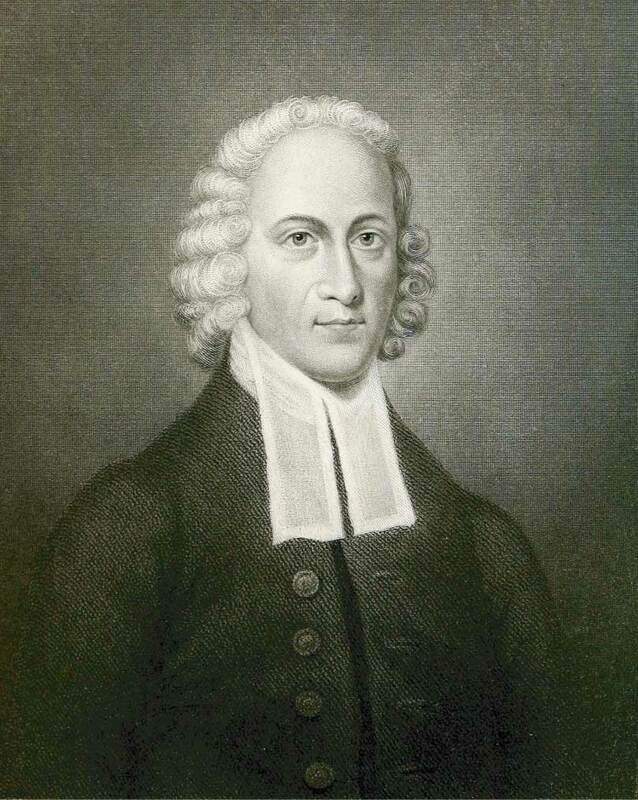 Jonathan Edwards was born into a Puritan evangelical household on October 5, 1703, in East Windsor, Connecticut. He was the fifth of eleven children born to the Rev. Timothy and Esther Edwards. His childhood education immersed him not only in the study of the Bible and Christian theology but also in classics and ancient languages. During his undergraduate years (1716-1720) and graduate studies (1721-1722) at Yale College, Edwards engaged all manner of contemporary issues in theology and philosophy. He studied the debates between the orthodox Calvinism of his Puritan forebears and the more "liberal" movements that challenged it, such as Deism, Socinianism, Arianism, and Anglican Arminianism, as well as the most current thought coming out of Europe, such as British empiricism and continental rationalism. From early in his life, Edwards committed himself to vindicating his beliefs before the foreign luminaries of the Enlightenment by recasting Calvinism in a new and vital way that synthesized Protestant theology with Newton's physics, Locke's psychology, the third earl of Shaftesbury's aesthetics, and Malebranche's moral philosophy. In 1726, Edwards succeeded his grandfather, Solomon Stoddard, as the pastor of the church in Northampton, Massachusetts, the largest and most influential church outside of Boston. Turning his attention from the theoretical pursuits of his Yale years to more practical matters, he married Sarah Pierpont in 1727. Jonathan and Sarah had met in New Haven eight years earlier, when she was just thirteen years old, but they were not married until eight years later. The two of them would go on to raise ten children in Northampton. In 1734-1735, Edwards oversaw some of the initial stirrings of the First Great Awakening. He gained international fame as a revivalist and "theologian of the heart" after publishing A Faithful Narrative of the Surprising Work of God (1738), which described the awakening in his church and served as an empirical model for American and British revivalists alike. The widespread revivals of the 1730’s and 1740’s stimulated one of the two most fruitful periods for Edwards' writings. In this period, Edwards became very well known as a revivalist preacher who subscribed to an experiential interpretation of Reformed theology that emphasized the sovereignty of God, the depravity of humankind, the reality of hell, and the necessity of a "New Birth" conversion. While critics assailed the convictions of many supposed converts as illusory and even the work of the devil, Edwards became a brilliant apologist for the revivals. In The Distinguishing Marks of a Work of the Spirit of God (1741), Some Thoughts Concerning the Present Revival (1742), A Treatise Concerning Religious Affections(1746), and The Life of David Brainerd (1749), he sought to isolate the signs of true sainthood from false belief. The intellectual framework for revivalism he constructed in these works pioneered a new psychology and philosophy of affections, later invoked by William James in his classic Varieties of Religious Experience (1902). Perry Miller, the grand expositor of the New England mind and founder of the Yale edition of the Works of Jonathan Edwards, described Edwards as the first and greatest homegrown American philosopher. If the student penetrates behind the technical language of theology, Miller argued, "he discovers an intelligence which, as much as Emerson's, Melville's, or Mark Twain's, is both an index of American society and a comment upon it." Although nineteenth-century editors of Edwards "improved" his style out of embarrassment for his unadorned, earthy, and earnest language, today Edwards is recognized as a consummate and sophisticated rhetorician and as a master preacher. Literary scholars connect Edwards' psychological principles with his emphasis on rhetoric as a means of eliciting emotional responses, most readily seen in the most famous sermon in American history, "Sinners in the Hands of an Angry God" (1741). They also point to Edwards' "Images or Shadows of Divine Things" (published by Miller in 1948) as an innovative application of typology that anticipated Transcendentalism by including nature as a source of revelation. Edwards’ published writings at Northampton also reflect strong millenarian and prophetic interests. In A History of the Work of Redemption, originally preached as a sermon series in 1739 but not published until after his death, Edwards cast theology into "a method entirely new" by showing God's work as a history structured around God's scriptural promises and periods of the outpouring of the Spirit. An Humble Attempt to Promote . . .Extraordinary Prayer (1747) was part of a larger movement towards Anglo-American "concerts of prayer" and was an important contribution to millennial thought. Scholars such as Alan Heimert have recognized the signal importance of these works in American history, particularly their contribution to revolutionary ideology. In 1750, Edwards’ church dismissed him from Northampton after he attempted to impose stricter qualifications for admission to the sacraments upon his congregation. Concerned that the "open admission" policies instituted by Stoddard allowed too many hypocrites and unbelievers into church membership, he became embroiled in a bitter controversy with his congregation, area ministers, and political leaders. His dismissal is often seen as a turning point in colonial American history because it marked the clear and final rejection of the old "New England Way" constructed by the Puritan settlers of New England. In her study of Northampton during Edwards' pastorate, Patricia Tracy described the social and political forces at work in the town as a reflection of larger economic, social and ideological forces then reshaping American culture. Ironically, then, the colonial theologian who best anticipated the intellectual shape of modern America also was its first victim. Edwards' struggle with these forces is recorded in the many manuscript sermons that will be made available on the website by the Jonathan Edwards Center at Yale. From Northampton, Edwards went to the mission post of Stockbridge, on the western border of Massachusetts, where he served from 1751 to 1757. Here he pastored a small English congregation, was a missionary to 150 Mahican and Mohawk families, and wrote many of his major works, including those that addressed the "Arminian controversy." Foremost among these was A Careful and Strict Inquiry into the Modern Prevailing Notions of that Freedom of Will..." (1754), in which he attempted to prove that the will was determined by the inclination of either sin or grace in the soul. This book, one of the most important works in modern western thought, set the parameters for philosophical debate on freedom and determinism for the next century and a half. Also written during this period were The Great Christian Doctrine of Original Sin Defended (1758), in which Edwards asserted that all humankind has a natural propensity to sin due to its "constitutional unity" in Adam; and two major statements on ethics, The Nature of True Virtue and The End for Which God Created the World (published posthumously in 1765). Though Stockbridge provided something of a haven for Edwards, he could not avoid the limelight. In late 1757, he accepted the presidency of the College of New Jersey (later Princeton University). While at Princeton, Edwards hoped to complete at least two more major treatises, one that would show "The Harmony of the Old and New Testaments" and the other that would be an experiment in narrative theology, a much expanded treatise on "The History of the Work of Redemption." However, he did not live to complete these works. After only a few months in Princeton, he died on March 22, 1758, following complications from a smallpox inoculation. He is buried in the Princeton Cemetery.